Middle East region is recording immense opportunities in the power tools industry, wherein Turkey and Iran posted highest market revenues. In the GCC region, Saudi Arabia and UAE recorded highest marker revenue share. The power tools industry is predominantly driven by growth in construction sector, followed by manufacturing and automotive sectors. During 2014-16, several Middle East countries particularly, Saudi Arabia recorded decline in economic growth, affecting the overall construction sector. This decrease in economic growth was primarily due to decline in oil prices, however, post 2017, countries reported uplifted growth as a result of increasing number of construction project contracts. Additionally, infrastructure, hospitality, and retail were the key growing sub-sectors. 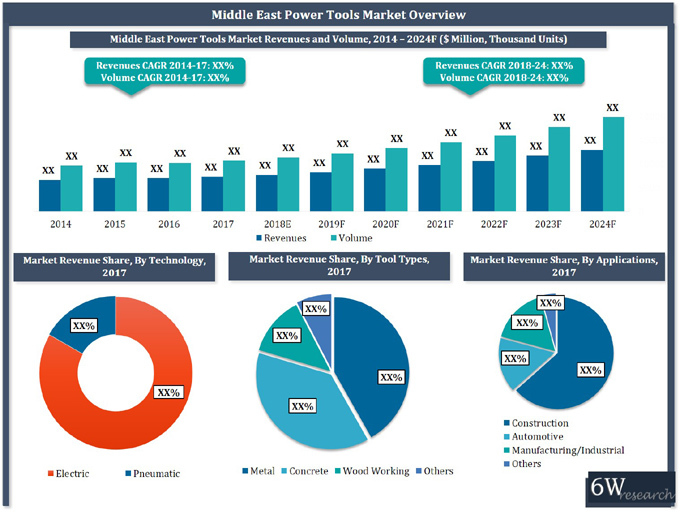 Within power tools market, electric power tools segment would continue to acquire further growth, however, pneumatic power tools segment would register high growth during the forecast period, backed by expected growth in automotive and manufacturing sectors. The report thoroughly covers the market by tool types, technology types, applications, and countries. The report provides an unbiased and detailed analysis of the on-going trends, opportunities/high growth areas and market drivers, which would help the stakeholders to device and align market strategies according to the current and future market dynamics.